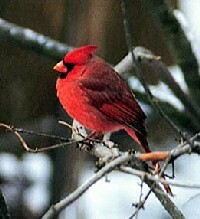 We invite you to help develop a census of birds found in Belmont County, Ohio. Please contact us to share any related communication and list, which we will post on this website, along with acknowledgements of your help in developing the census. A bird census for the Wilds, which is located about 40 minutes west of Stratton House, is available on their web. It lists the 150 species of birds identified to date. Also,check out the valuable related resources at Ohio History Central, which provides information on the Northern Cardinal (shown here) and other birds found in Ohio.